The surfaces of cities are worlds of political discourse and spatial production. They are objects of legal contention, and social spaces of visibility and display. I believe cities can deeply reveal themselves through their surfaces, and my current research is dedicated to showing different ways in which this might happen. Surfaces as claims to the right to the city. I work between these dimensions, through frameworks such as surface semiotics, visual culture and legal geography, to investigate urban surfaces and inscriptions and to establish the foundations for what might become a discipline of surface studies. I argue for the right to the surface as a form of right to the city, which is something I have been writing about here and here. This is why my website is called “THE RIGHT TO THE SURFACE IS THE RIGHT TO THE CITY”. I also wrote a manifesto on the right to the surface. You can read it (and suggest edits) here. Click through the links below to read some of my thoughts on surfaces and inscriptions, which I’ve organised in five categories here (based on the five chapters of my PhD thesis). The links also show images I’ve been working with, and examples of the surface semiotics work I have been developing. Surfaces are deep, although they appear shallow. Neutral surface mode does not exist. Graffiti and street art are not that interesting (but hybrid inscriptions are). Multiple emplaced inscriptions can be interpreted through a semiotics of surfaces. 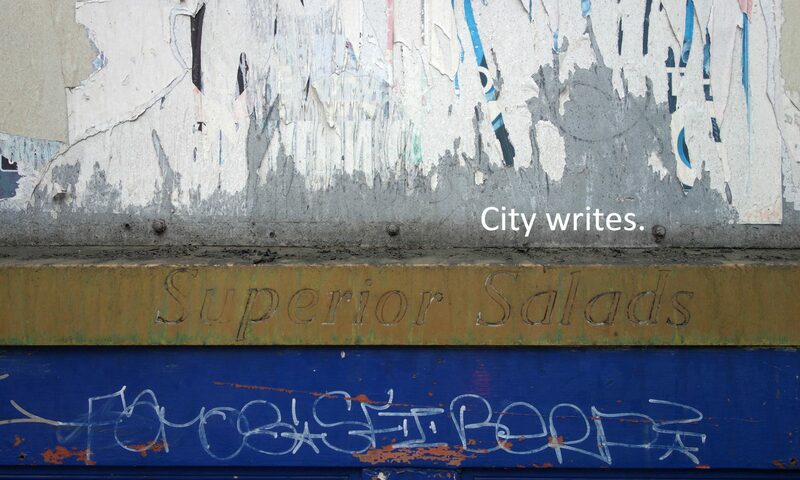 Interviewing walls is an ethnographic method for understanding the city. The sign is the city. In the production of graffiti and street art, the agency of producers is little measure for the authority of managers and regulators. Art vs Crime is a dangerous and misleading paradox. Beauty is not better: what we need is politics, not aesthetics. The story of urban mark making is the story of authorities taking control of the city and putting it to capitalist use. The sign is the name. From DIY to ‘walk this way’, each (street art) culture gets the tours it deserves. Coolness, Creativity and Streetness are toxic simulacra of cool, creative streets. Tours fall flat compared to the productive forcefulness of city surfaces. Design a place for street art, and you will have designed street art out of that place. Damage against property and offence against order are highly volatile categories. The threat of graffiti comes from the collective stamina of the culture. Vision matters and materiality matters. Graffiti turns private property into a precarious commons (precariousness is accessibility). Surface conflict is spatial justice. Doing nothing can be the best graffiti management strategy. In the relentless build-up of paint, each layer is victorious. The thickness of surfaces forms a distinctive lawscape. Permanently-becoming creativity is preferable to creativity becoming permanent. Hi I am a researcher in Norway (once Bartlett Grad School). I’ve become interested in urban inscription (solicited, legal, not-permittted, more) as part of cultural identity, espeically how long they do/ can/ are intended to/ are expected to last. Returning from Melbourne, I became inspired to look again at this area. Do you have a publication list I can see, particularly Leake Street? Hard to get over for any length of time, but the event looks great. Hi Joel, sounds like we have very similar areas of interest. I can send you a couple of articles via email, they are book chapters waiting to be published which may contain some relevant info. The Leake Street project will be shown as part of Urban Lab’s Cities Methodologies exhibition. I have some notes on it but haven’t done a proper write-up yet, am happy to send the notes though if you are interested! Hi Sabina, Im a architecture diploma student studying Leake Street for my thesis project. What a fascinating area it is, with it constantly changing and all its glorious grittiness. My interest mainly lies in Leake Streets future. What will happen when all the development around York Road commences and can we preserve a future for this subculture quarter thats growing below waterloo without a complete gentrification of the area. I would be really fascinated to read your write up on Leake Street if possible. Im gutted I missed your tour back in October. Hi Josh, how exciting! Do you want to drop me an email sabinaandron@gmail.com and we can meet to discuss? Hey Sabina! I am currently studying a Master’s in UCL, and looking at the street art patterns in relation to space and the urban grid. If you are in London, or if we could have a chat, let me know.